Now that possessing up to an ounce of marijuana is legal in Colorado and Washington state; state law enforcement is scrambling to solve the problem of drug sniffing dogs. Washington in particular has a border to deal with – one that has spent decades formulating plans to keep out the notorious “B.C. bud”. Pot isn’t legal in B.C. but you wouldn’t know that by visiting Vancouver, dubbed “Vansterdam” – numerous “pot cafes” allow patrons to bring their own marijuana and openly consume it. So what to do with all the drug sniffing dogs? To begin with, how do you train a dog to differentiate between quantities of pot? On the Washington side of the border; a search undertaken as a result of an alert by a canine detective could possibly turn up unexpected contraband – perhaps illegal weapons were found but the amount of marijuana setting the play in motion was less than an ounce – strictly speaking, a judge could toss that evidence out of court as an “illegal search and seizure”. Logically, Washington state is training new dogs, ones not taught to recognize pot. Fair enough, but isn’t the whole marijuana question wearing thin? Up to an ounce is now legal in Washington and Colorado if you’re 21. In Vancouver where pot isn’t even legalized – pot cafes are allowed to operate without question as long as they don’t sell marijuana. Anyone can get a medical marijuana ticket, dispensaries as prevalent as drug stores. Glaucoma, MS. Parkinsons, insomnia, chronic pain, seizures – the list of ailments doctors can “prescribe” Cannabis for is longer than my arm. Governments allow sale and possession for medical reasons yet won’t allow you to grow a few plants at home. Criminal records tarnish lives for eternity, gangs shot each other over turf, prisons fill up with people caught with a “little too much” and organized crime reaps the benefits. There are much bigger fish to fry – why not legalize marijuana, put people to work growing it, sell it as you would cigarettes, collect taxes and only go after those who think they can make a living outside these parameters. What’s the big deal? There are a lot of confused dogs without jobs who think it’s just as silly. 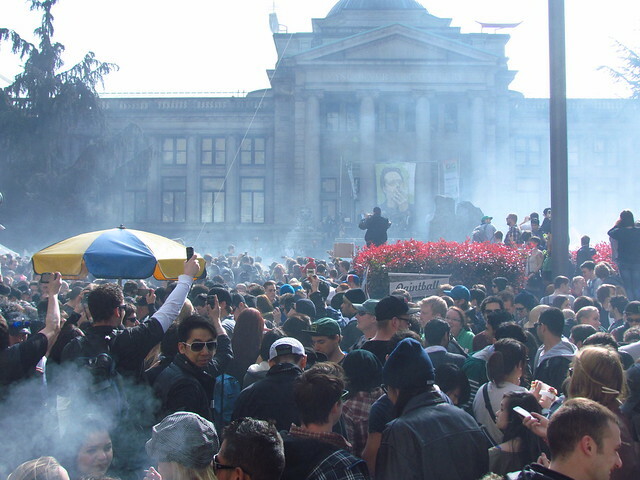 4/20 at the Vancouver Art Gallery (origin of 4/20 is a little clouded but at exactly 4:20 on April 20 of each year Cannabis enthusiasts light up) No – there isn’t a house on fire – simply a collective exhale. Imagine being forced to leave your family to live with a group of strangers. One of these strangers is now your husband. You are his property, you are invisible. Under the law obedience is all that matters. Divorce is not an option. Your body no longer belongs to you. You might be raped, beatings are encouraged as a means of love and instruction. You can not work, drive a car, or ever leave home unescorted. You can not contact your family without permission from your husband. If you complain you may be returned to your family, who must repay your dowry. You may be murdered in a perfectly acceptable “honour killing” aimed at keeping order. It would be unfair to paint all of Islam with the same brush. That said, for those women born into a fundamentalist part of the world, the reality is tragic.